Yesterday was a classically real life kind of day. There was some good, some bad, some tired and sad. We laughed and moped and tried to look at things from a balanced perspective. Things don’t always work out the way we think they should, but if that isn’t real life, I don’t know what is. We’ve been watching Hunter for a few days, because I discovered his stall was uncharacteristically dry after a long overnight stay last weekend. When it happened another night, Cyndie decided to have the vet look at him, in case there was something amiss. Since our usual equine vet has moved to a different practice, we ended up getting the owner. Even though Cyndie expected the vet to arrive in the morning, he didn’t get here until late in the day. Cyndie got the impression he wasn’t an equine specialist. I’m guessing he is probably an expert in dairy cows. Even though the visit sounded awkward, we feel like he was able to establish that Hunter is clear of any grave ailments. Our boy’s temperature was normal and the levels in his blood were all mid-range. When I got home from work and was cleaning Hunter’s stall, it was obvious he had peed in there during the long wait for the vet to arrive. We also spotted him peeing out in the paddock, so he has proved to us that things are at least functioning. It is quite possible that he just doesn’t like messing up his “bedroom.” We know a certain Ms. Barksalot who absolutely refuses to soil her kennel. It is a little unsettling to have lost confidence in our vet of choice. I think we will be investigating other options for the future. There was one particularly heartwarming scene that occurred with the horses yesterday. After the vet left, Cyndie let the other 3 horses out into the paddock, but kept Hunter inside while he recuperated from a sedative and pain-killer that he had received. 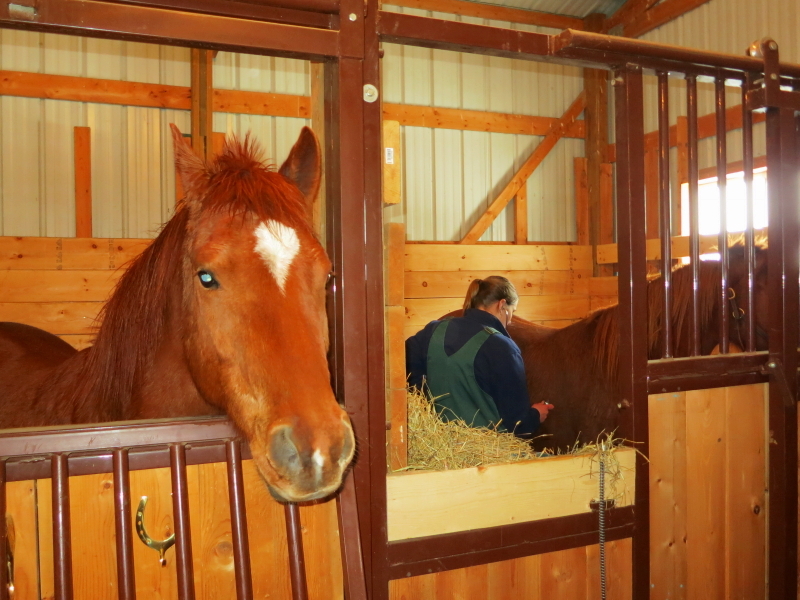 She worked on cleaning the other stalls to give him some company while he lazily munched on some hay. Outside, the other three were down in their favorite spot, grazing in the hay circle. I stepped out of the back of the barn to dump the wheelbarrow and Cyndie followed while telling me stories of the day. 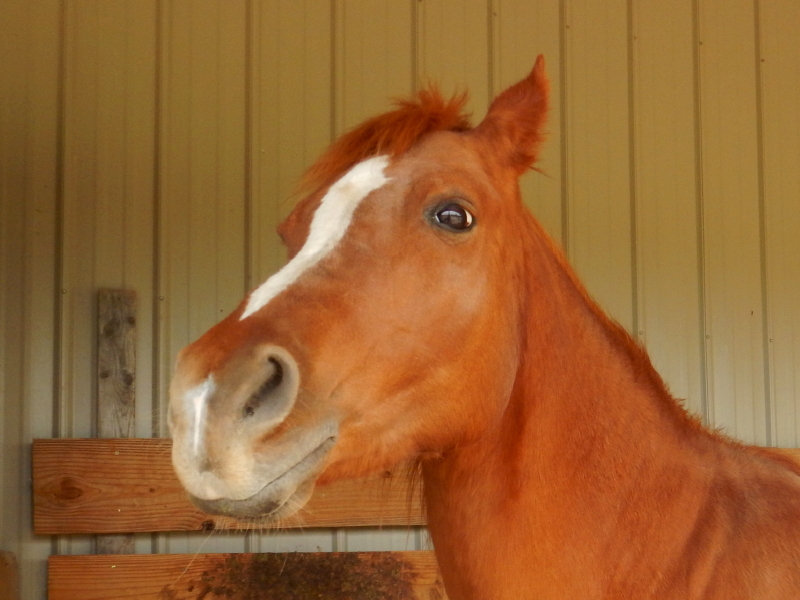 When Hunter suddenly found himself alone in the barn, he whinnied a little distress signal. Instantly, Legacy answered the call with his own vocal response while running up the hill to the barn. There was something about the body language and immediacy of Legacy’s reaction that overflowed with the loving care of a passionate leader. It was a beautiful thing. Cyndie went in and walked Hunter out to the paddock. She said Legacy met them right at the door and leaned over the fence to touch noses with Hunter in an extension of his caring, showing affection for the temporarily distressed herd member. It was wet and cold outside, with more rain expected, but there were moments like that which felt almost like warm sunshine. It was a lot like a real life kind of day. 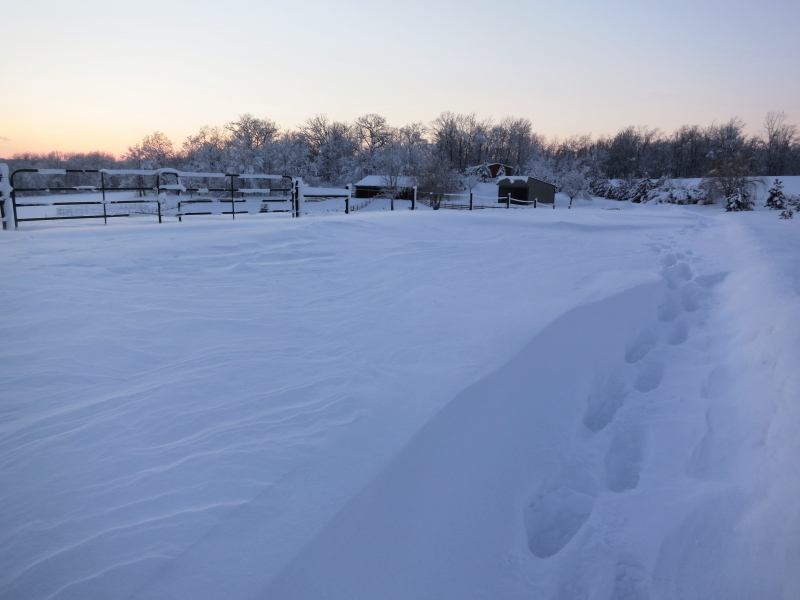 Before our thoughts became totally consumed with this latest blast of a winter storm –which has drifted snow across the 4 foot banks of our driveway, filling it completely– we received a visit from our veterinarian for a well-check of our horses. It was Thursday, and Cyndie and I had both stayed home from work in the face of the posted winter storm warning. We had cleaned up the stalls in the barn, and moved the horses inside out of the rain that was falling in prelude to the snow. We weren’t entirely surprised to receive a phone call from the vet’s office checking to see if we wanted to reschedule. We weren’t the ones doing the driving, so we definitely wanted this appointment to happen, if the vet didn’t mind navigating the icy roads. Cyndie headed down to our barns at the appointed time, to find the vet already inside, making her own introductions to our 4 horses. She really loved “our gray,” Legacy, saying he was “cute.” As the rain began to change over to snow, the vet stepped into each stall to listen to heart beats and lung sounds, feel their teeth, and do an overall survey of their condition. The horses had blood samples drawn, and received a vaccination shot and dose of deworming paste. There were two valuable things we learned. First, we can begin to cut back on their feed rations. With the cold temperatures we have been facing this winter, we have been making sure they were well fed. The vet said our horses are not overweight, but we don’t want them to get any bigger. We can change the feed we are giving them to one that provides just essentials and nothing more. She instructed us to be very careful about the transition back to grazing fresh grass. We cannot allow them uncontrolled access to the fields. They need to be restricted to the sacrifice area of our paddocks, with brief, but increasing visits to the grass. The second thing the vet discovered is that the latest bale of hay we have been serving has too much foxtail grass in it. 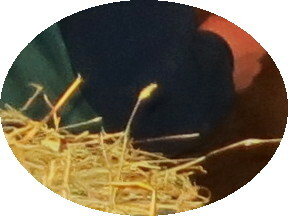 The awn, that stiff bristle at the top of the stem, can become embedded in their cheeks and tongue and create ulcers. 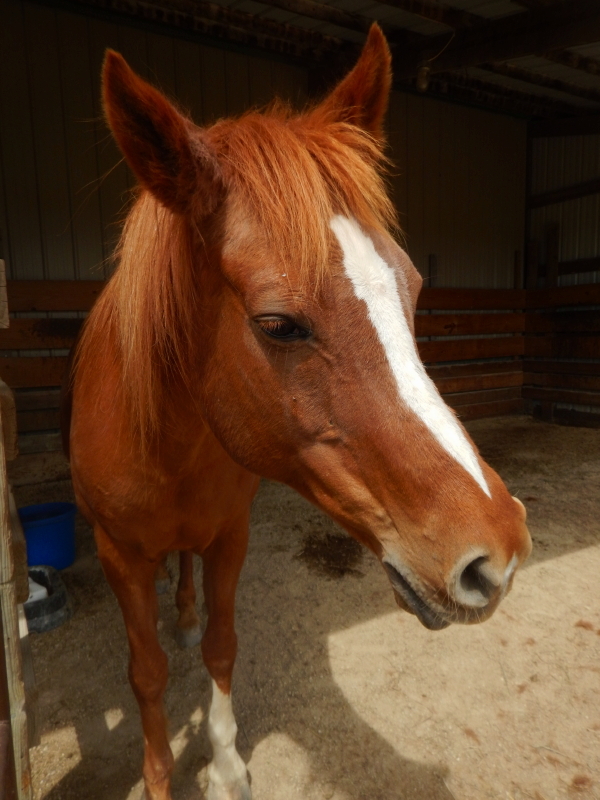 Three of our horses showed some signs of sensitivity or ulcerations in their mouths. We invited her to look at our remaining bales to give us her opinion of what we have on hand. From her review, we think it will be okay to just work around the worst bale and pick and mix from the remaining two batches of bales we have. Next fall we will make another appointment to have the vet “float their teeth,” which is what they call it when they file down any sharp points that develop. With that, her visit was done and she drove off into the wicked weather. We are relieved to know our horses are doing well and that the two things deserving attention are well within our ability to manage. That is a really good thing right now, because it allows our attention to get back to being all-consumed by the tonnage of snow that remains to be removed from our driveway and barn paths today. Yesterday I heard Cyndie wondering out loud about seeing if George Walker might want to bring his Belgian draft horses over to teach us how to drive the team while clearing snow with them. That’s not such a bad idea, because the way “horse power” is measured, he has a lot more in his team of horses than I have with my 44hp Ford New Holland 3415 tractor.